The Internet seems like another member of the family sometimes. It lives in our home and follows us wherever we go, it vies for our attention, and it entertains us. The habits we fall into around our online lives has a profound effect on our family relationships, especially when it comes to parents and kids. Earlier this year, the London School of Economics and Political Science launched a massive survey of 25,000 children and their parents all across Europe about their practices and perspectives. Sonia Livingstone, social psychology professor and head of the department of media and communications, worked on the detailed report -- as well as a more synthesized list of myths -- and came away with some thought-provoking recommendations for parents. "Children are often happy to share with their parents and show them what they know." Livingstone was interviewed by DML Central, produced by the Digital Media and Learning Research Hub. It's worth reading the entire interview, but here are a few imperatives Livingstone recommends. DON'T MAKE ASSUMPTIONS. We talk a lot about digital natives, and their aptitude in technical skills. While it's true that a lot of kids are savvy about navigating the Web -- and that they can figure out a lot on their own -- the parents' role is still vital. Livingston says that when she asked some kids to demonstrate setting up their privacy settings, they were at a loss. "When you check out their skills and their understanding, it’s less than they claim," she says in the DML article. "They know they are being celebrated for being the digital natives, but there are many participatory skills, safety skills and creative and technical skills that they need input on and help with." Younger kids, especially, need support and help in developing digital skills. OFFER TO SHARE, NOT SUPERVISE. Rather than insisting on being Facebook friends with kids in order to keep tabs, parents will get much further if they ask to become involved with kids' online lives, Livingston says. Of those asked in the survey about parent involvement, most kids said they don't think their parents are asking too many questions or being intrusive. "I think kids are often quite proud of what they can do online," Livingston said. 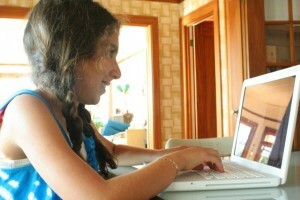 "If parents feel the need to monitor their child’s online friends, then of course the child will not warm to this. But if a parent says 'I keep hearing about Facebook, and I don't understand it. Please show me how it works,' children are often happy to share with their parents and show them what they know." KNOW THE DIFFERENCE BETWEEN RISK AND HARM. It might seem like just a semantic distinction, but recognizing the difference between risk and harm is important. Livingston contends that while the risk is real when it comes to being exposed to inappropriate material online, the probability of harm is low. "The risk remains but the parents’ task is not to eliminate risk but do everything they can to make sure the low probability harm doesn't happen to their child," she says. "Children have to encounter risks because it’s how they live and learn. It’s how they go out into the world and become resilient.